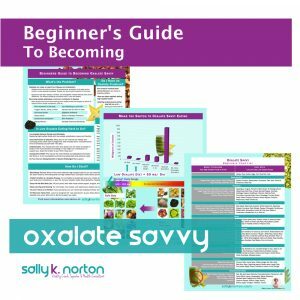 The Beginner’s Guide is a colorful three-page document that explains the basics for getting started with oxalate-aware eating. The Guide answers common questions about the purpose, safety, and flexibility of this ea ting strategy. Page two visually presents an overview of the problem, its solution, and defines a low oxalate diet. Page three features a useful and accurate list of worst offender and safe bets foods to help you learn the basics of a lower oxalate intake. By buying the Beginner’s Guide for $2.50 you’ll be helping to keep this website going. Thanks. Have fun eating a less toxic diet and living in a better body.